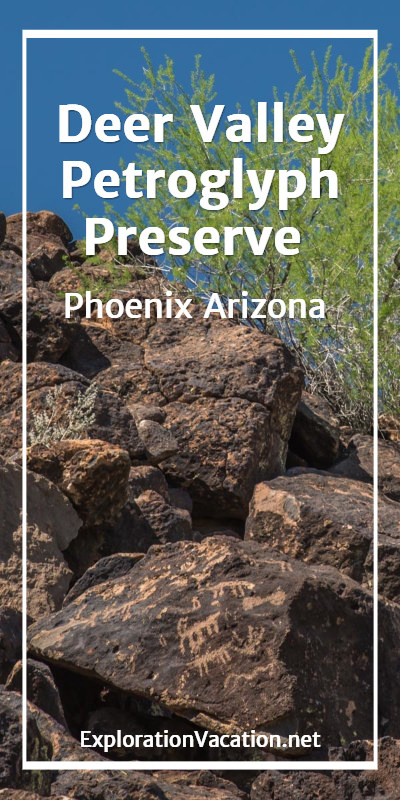 Just north of Phoenix, the Deer Valley Petroglyph Preserve protects over 1,500 symbols cut into boulders by several ancient cultures. While modern Phoenix is a young city, people have inhabited this area for thousands of years. Some of the earliest people left evidence of their presence here in the form of symbols cut into the rocks. Several of these sites exist right in the Phoenix area, but one of the largest is located at the north edge of Phoenix in Deer Valley. While there is no evidence that a large community was ever established here, the Hedgpeth Hills in Deer Valley were visited and inhabited by smaller groups for thousands of years. The first of these were Archaic people who came to the area at least 5,000 years ago and left little evidence of their presence except for the carved rock. Generations later they were followed by Hohokam and Patayan people who left their own marks in the rock here as recently as 800 years ago. 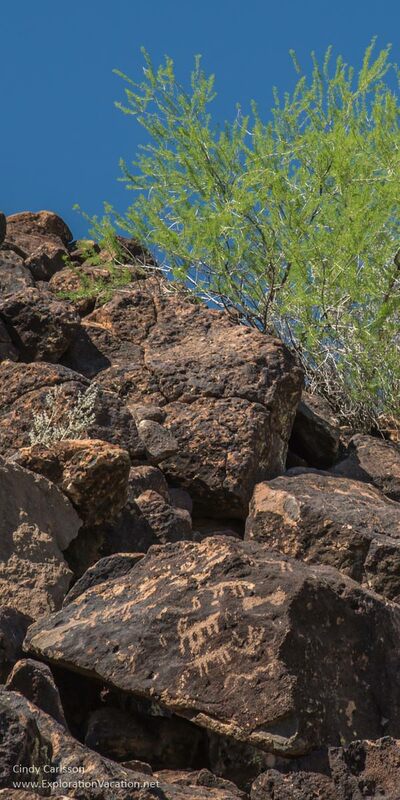 Both archaeologists and the modern descendants of the Hohokam and Patayan think the petroglyphs here were carved into the rocks as part of sacred ceremonies. (Native people continue to recognize this as a sacred site.) And, while no one knows for certain what these symbols meant to the people who created them, many are still found in tribal imagery. While specific details may be lost, these carved stones still carry messages from the ancient past. Petroglyphs are made by pecking, scratching, or otherwise cutting patterns into a rock surface. Some are created by carving deeply into the stone. Others, like the rock art at Deer Valley, are carved or scratching just deep enough to break through the surface patina and to reveal the lighter color below. The oldest petroglyphs at Deer Valley are thought to have been created 5,000 years ago by Archaic people. These ancient people left signs of their presence in the form of circles, rings, and various patterns made with straight or wavy lines. A few thousand years later, the Hohokam and Patayan people came to this area. They also created petroglyphs, but their images often portray animals and humans. Pictographs (also called petrographs) are also common in the desert southwest. Unlike petroglyphs, pictographs are made by drawing or painting images onto a rock surface using charcoal, blood, or pigments made from various minerals or other natural materials. Pictographs are usually found only in areas where they are well protected from sun, wind, and rain. There are no pictographs at the Deer Valley site. The carvings at the Deer Valley Petroglyph Preserve are part of the Hedgpeth Hill archaeological site. While archeologists had long known of the Hedgpeth Hills petroglyphs, plans to preserve the site didn’t come together until the 1970s when it was threatened by a flood control project. An agreement to limit a new dam’s impact on the site was reached in 1976. An archaeological study followed in 1980. Arizona State University took over management of the site in 1984, and the museum and research facilities were built ten years later. From the visitor center, a ¼ mile trail leads visitors along the edge of a rocky hillside where a large number of petroglyphs are visible. This is both an important archaeological site and a sacred site for descendants of the Hohokam and Patayan people who left these images in the rocks. 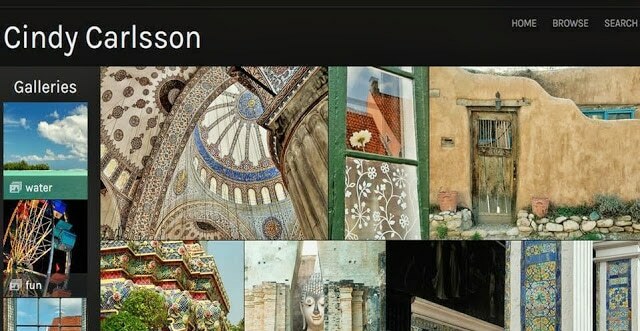 Visitors need to respect the site’s dual roles. That means staying on trails and avoiding the temptation to touch the petroglyphs or spiritual items left at the site. The Deer Valley Petroglyph Preserve is less than 50 acres in size, but contains over 1,500 carvings cut into almost 600 black basalt boulders. In addition to the petroglyphs, the site also has a couple of ancient stone quarries, a few stone masonry rooms, pits, and other evidence of past occupation. Only a small portion of the site is open to the public. While it is easy to tour the Deer Valley Petroglyph Preserve without first stopping in the visitor center, don’t do it. Designed by Phoenix architect Will Bruder and constructed in 1994, the stone, steel, and precast concrete visitor center is both a shelter from and an extension into the surrounding desert. Inside, it offers an excellent introduction to the history of the site, the petroglyphs found here, and the people who created them. It also shows you exactly what you will be looking for once you head outside. There are also temporary exhibits. When we visited in 2016 there was an interesting exhibit on the Hohokam, people who lived in the Phoenix area for at least 1,500 years and created some of the petroglyphs visible here. The current exhibit explains how archaeologists use pottery fragments to understand the lives of the people who made and used that pottery. Arizona State University uses other spaces in the building for research, preservation, and education. From the nature center, a short trail leads through a wash and natural area to the petroglyphs. Even having seen pictures in the visitor center, I’m still shocked to see the site itself. The Deer Valley petroglyphs are found on boulders scattered throughout large piles of rock. It looks like the remains of a giant quarry! It takes a while to locate the first petroglyphs. Even having seen examples in the visitor center, we aren’t sure where to look amid all these rocks! Fortunately, good signage and helpful visitors and volunteers point us to the first ones along the trail. After that, we start seeing them all over. It’s hard for me to imagine this jumble of rock as a ceremonial site, but the ancient people who left these symbols lived lives quite different from my own. Clearly this was an important place. And, based on the number of carvings here, these jumbled rocks must have met their needs for many generations! This site has gone by various names over the years, including the Deer Valley Rock Art Center, the Hedgpeth Hills Petroglyph Site, and the Sonoran Desert Preserve. They all refer to the same general location. 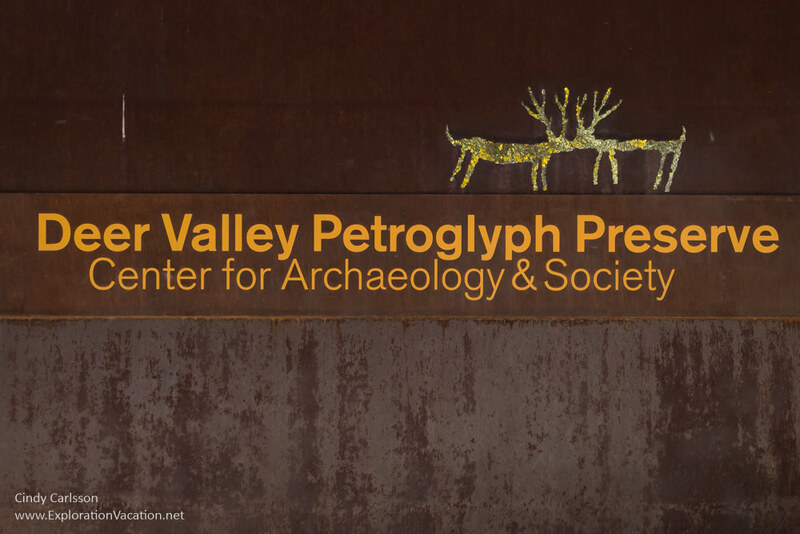 Today the Deer Valley Petroglyph Preserve is part of the Center for Archaeology and Society at Arizona State University. The Hedgpeth Hills archeological site includes the area where the petroglyphs are found. There is a small admission fee to view the petroglyphs. The Deer Valley Petroglyph Preserve is located just north of the city of Phoenix, right off Deer Valley Road. Check the website for detailed directions, as the site is surrounded by suburban development, making it easy to think you have somehow gotten lost. This being Phoenix, the easiest way to get here is by driving. There is ample parking near the visitor center. A flat ¼ mile trail leads from the visitor center to the petroglyphs. A trail guide is available in the visitor center. In addition, volunteers on the trail are happy to point out petroglyphs and provide information about the site. The Deer Valley Petroglyph Site is open to the public Tuesday – Saturday throughout the year. Current hours are 9 a.m. to 4:30 p.m., with the last entry to the trail at 3:45 p.m. Check the website for current hours, special events, and admission fees. Rock art can be fiendishly hard to spot if the light isn’t just right. But, for a variety of reasons, we ended up visiting in mid-afternoon when the sun was especially harsh. As we walked through the area, sunlight buried some petroglyphs in deep shadow while bouncing blindingly off of others. It was hard to even see, let alone photograph, many of the carvings. The longer rays of early morning or late afternoon sunlight highlight carvings, making these the best times to view petroglyphs. However, the Deer Valley site is generally oriented to the east. That means the sun shines directly on it for much of the morning. While there is some shade in early morning and late afternoon (making the petroglyphs easier to see), the site’s hours don’t allow for visits really early in the morning or late in the afternoon. Fortunately, the individual rocks sit at a variety of angles and are often carved on more than one side. That variety ensures that no matter when you visit, the sun will likely highlight at least some carvings even while it obscures others. For the best photographs, avoid early afternoon and look for carvings where the light is at an angle. Give yourself the best chance of managing glare and bringing out the color in the carvings by using a polarizer. And, if you are really serious, bring a small folding reflector to direct light into shadowed areas. Whatever you do, stay on the trail, don’t touch the petroglyphs, and stay out of the way of other visitors. Really Cool Thanks for posting this. Always in awe of Petroglyphs. Sometimes I really wish time machines were real. Petroglyphs and pictographs are some of my favorite things – in some ways they are as close to a time machine as we can get, since they really are the “voice” of ancient people. There are a lot of them in Arizona and I’m trying to work my way through all of the ones around Phoenix and Sedona. I think I only have two more sites to go, and one I want to revisit because it’s amazing and it’s been at least 20 years since I’ve been there and my spouse has never been there. Can’t wait to read about those adventures! I have visited a couple of other sites in Arizona with history about the Hohokam people. Fascinating. I haven’t been to the Deer Valley Petroglyph Preserve though. It looks interesting and worth a visit. It’s an interesting site, but it’s little. A good place to stop by if you are in the area, but not one to go far out of the way for.